The higher number, or systolic pressure, refers to the pressure inside the artery when the heart contracts and pumps blood through the body. The lower number, or diastolic pressure, refers to the pressure inside the artery when the heart is at rest and is filling with blood. Each time the heart beats, it pumps blood into the arteries, resulting in the highest blood pressure as the heart contracts. Both the systolic and diastolic pressures are recorded as mm Hg (millimeters of mercury). This recording represents how high the mercury column is raised by the pressure of the blood. High blood pressure means that there is higher than normal pressure inside the arteries either during systole (when the heart contracts and pumps blood through the body), or during diastole (when the heart is at rest and is filling with blood. If the pressure is high during the resting period (diastole), then the second number recorded (the diastolic pressure) will be high. Blood pressures vary depending on the age of your child, as well as according to height and weight, and the gender of your child. Generally, blood pressure is low in infancy, and rises slowly as children age. Boys' blood pressures are slightly higher than girls' are, and taller people generally have higher blood pressures than short people do. For example, an infant may have a quite normal blood pressure of 80/45 mm Hg, while that value in an adult is considered low. A teenager may have an acceptable blood pressure of 110/70 mm Hg, but that value would be of concern in a toddler. The National High Blood Pressure Education Program (NHBEP) recently prepared tables that help a physician determine when your child's blood pressure is higher than other children's blood pressure. The NHBEP prepared a table for boys and a separate one for girls. A range of blood pressure values is given based on how old and how tall your child is. According to the tables, If your child has a blood pressure that is higher than 90 to 95 percent of other boys or girls his/her age and height, then he or she may have high blood pressure. Again, many factors, including emotions, can affect blood pressure. Readings that are high compared to the values on the table may need to be investigated further by your child's physician. Heart attack and stroke related to high blood pressure are rare in children and adolescents. Yet, studies of young adults with high blood pressure found that many had high blood pressure as a child. By their 20s, studies show that children and adolescents with high blood pressure will exhibit harmful effects on the heart and blood vessels even with mild hypertension. Primary hypertension (with an unknown cause) is the most common cause of high blood pressure in adolescents and Many children with high blood pressure also have adult relatives with hypertension, so there may be a hereditary aspect to the disease. Your child's physician may note an elevated blood pressure reading during a routine office visit. Obtaining calm, resting blood pressures on several different occasions (days, weeks, or months apart) will provide better information about whether the blood pressure elevation is consistent or due to fear or stress. Your child's physician will obtain a medical history, including information about your child's diet, exercise level, home and school activities, and possible stressors. A physical examination may also be performed. Other tests may be needed to evaluate the health of other organs (such as the heart or kidneys) which may contribute to hypertension. These interventions can lower systolic and diastolic blood pressure, improve the strength of the heart, and lower blood cholesterol - all important steps in preventing heart disease as an adult. Medications to control high blood pressure are only needed in about 1 percent of children with the disorder. Consult your child's physician for more information. Our Preventive Cardiology Program creates a personalized plan of diet and exercise to reduce the risk of heart disease in children and teenagers. 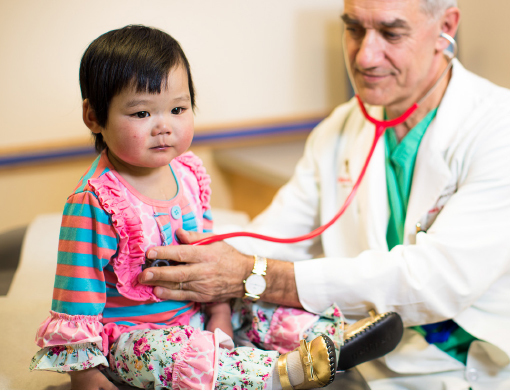 The Hypertension Detection and Treatment program team works closely with our Nuclear Medicine Program and the Division of Cardiology to perform a comprehensive diagnostic evaluation to understand the cause of your child’s elevated blood pressure.